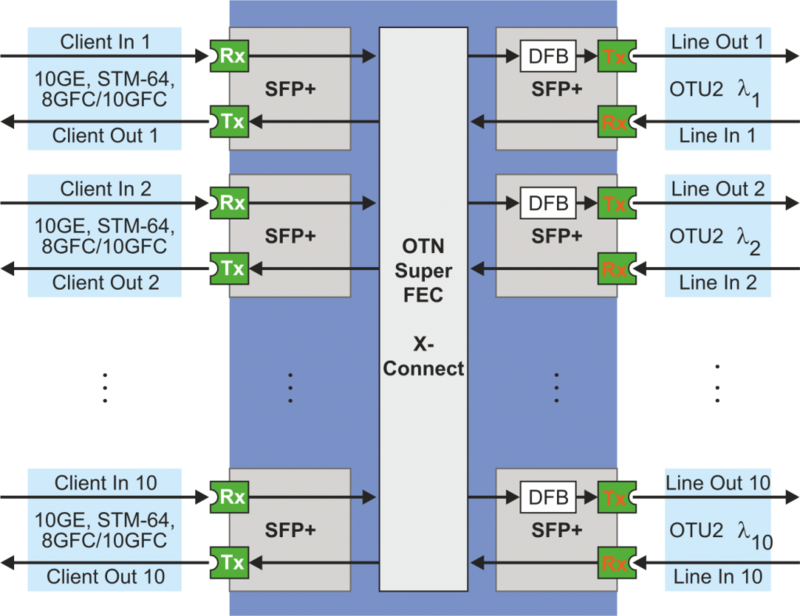 Compact system for transmission of 10 Gbit/s signals with Super-FEC. The system supports any 10 Gbit/s data formats on client interfaces: 10 GE, STM-64 etc. Each client channel is converted in OTN OTU2 format and sent to the selected line port. All channels on the line side can be combined by an external multiplexer for transmission in a single fiber using CWDM or DWDM technology. Tunable SFP+ or “color” SFP/SFP+ with a fixed wavelength can be used on each line port. The use of standard SFP+ connectors significantly increases the cost-efficiency of the solution. High port density enables effective usage of the rack space. The device can be configures in 5-channel mode with a line redundancy 1+1. In this case each client channel is sent to two line ports: main and backup. These two line channels bearing the same client channel can be transmitted on different fibers or with OTN X-connect between the channels. The transponder supports Super-FEC error correction that guarantees a high quality of 10G signal. Equipment is fully compatible with OTN networks. OTN provides powerful capabilities for channel management, signal monitoring, and traffic statistic analysis.